We’re a mere 21 days away from Opening Day! Two more weekends without regular-season baseball! It’s warming up throughout the country and people are dreaming of summer nights spent at the ballpark. There is no guarantee that William Zachary Braddock makes the 25-man roster this year. That’s a common statement around the game of baseball in Spring Training, one which wouldn’t apply to Braddock if he had a season in 2011 like he did in 2010. In 2010, Braddock threw 33.2 major league innings over 46 appearances. His ERA was 2.94 with an opponent batting average of .228 and 41 strikeouts. In short, he was an effective reliever both in LOOGy situations and when working more than just a single out. During the course of the entire season, he only had two appearances where he allowed more than a single run. It was a good year. Heading into 2011, Braddock seemed destined for another quality year. Young, left-handed with quality stuff and the ability to get both left- and right-handed hitters out… It appeared that everything was going swimmingly. It ended up not being the case. Braddock went north with the team and made 25 appearances through the 14th of July. The results weren’t good enough. Over his final three appearances, Braddock only recorded two outs and allowed seven earned runs on five hits and three walks. There was talk that Braddock had been showing up to the ballpark late, which is kind of a trick when you consider that most games are played in the evening. Eventually, Braddock was placed on the disabled list with a sleep disorder. He was unable to get proper rest and, as such, wasn’t able to perform when on the mound. He was sent on a rehab assignment but wasn’t ever able to get himself back to the majors last season. It cost the team down the stretch as they didn’t have a left-handed pitcher in the bullpen. Manny Parra missed the entire season as did Mitch Stetter. Reports began to come out during the winter that Braddock finally had gotten his issues under control and was looking forward to being a healthy contributor in 2012. A blister issue slowed him down this spring, and so far the results have been mixed but it is Spring Training. Results don’t mean as much right now, especially when coming off such a long break as Braddock has. His most recent outing saw him pitch a full inning, recording two strikeouts while allowing one hit and one walk. He allowed no runs though. There appears to be an opening or two in the bullpen right now, but like I said at the top there is no guarantee that one of them will belong to Braddock. In fact, I’ll guess that Braddock will begin the season with the Triple-A Nashville Sounds to round himself back into form. As far as left-handed pitchers go, Manny Parra is healthy and throwing well and non-roster invitee Juan Perez has impressed, though he is currently recovering from a partially-collapsed lung. Braddock could still make the team by default, especially depending on the rest of the bullpen options. Bottom line, though, is that even if he doesn’t make the 25-man roster on April 6th, chances are good that we’ll see Braddock contributing at the Major League level before the season is through. 26 days away from Opening Day. The Brewers are 4-4-1 in Cactus League play for Spring Training. Which of these numbers means more? Clearly the Opening Day countdown! Spring Training records are even more meaningless than the statistics of the players which have played to the record attained. Another number that means something to the fans and players alike is the number on each player’s back. Something about jersey numbers becoming identifiable with certain players just rings true. The southpaw who hails from Sacramento, California stands 6’3″ tall while doing that pitching. The scale officially reads 205 pounds when he steps atop it. The frame and athleticism has never been in question for Manuel Alex Parra, even when he was drafted at 6’2″ and 185 pounds. Originally drafted, as are so many pitchers, to start games, Parra’s slow and steady climb through the organization has been one of determination and drive. He has had to overcome a number of obstacles to both reach and stay in the big leagues. From injuries to mechanics to bouts of ineffectiveness, something has continually been placed in Parra’s path to success. If there’s anything that his draft position tells you, however, it’s that he’s not going to let anything stand in his way. Ultimately, if it can be overcome, Parra will find a way. After being unable to stick in the starting rotation over the years, Parra was resigned to a role change and a spot in the bullpen for 2011. Unfortunately, Parra got exactly two pitches into the Cactus League season when he injured his back on March 3, 2011. Officially a “facet joint injury”, Parra was on a rehab assignment as early as April 9th. He then appeared in seven more games at Triple-A before having elbow pain and being diagnosed with a sprained ulnar collateral ligament in his pitching elbow as well as a flexor strain. Not wanting to risk further damage and possible surgery, Parra was prescribed rest and rehab. He did not pitch the rest of the season. To put a surgical capper on 2011, Parra underwent surgery at the end of August to remove a bone spur from his left elbow. To put it mildly, last year was an exercise in fortitude once again. Being out of minor-league options, as he was last year, it’s another important Spring Training for Parra. He isn’t guaranteed a spot on the 25-man roster (ultimately, few are) but his handedness works in his favor. The team lacked for not having any left-hander to call upon, let alone a quality one with the pure stuff which Parra possesses. He has competition for that role though. Zach Braddock has reportedly overcome his sleeping disorder and subsequent personal issues from last season and non-roster invitee Juan Perez has been raising eyebrows and turning heads in camp so far. The other element working in Parra’s favor is that he isn’t simply a LOOGy type. Parra has been effective against both right- and left-handed hitters throughout his career. He could fill a middle or long relief role in the bullpen but could also be called upon for those short appearances as well. Parra uses a low-to-mid 90’s fastball, a split-fingered fastball as his out pitch, along with a curveball and straight change up. They’re all effective pitches and he can throw each of them for strikes. So far this spring, Parra has had some effective appearances where he has missed down for the most part when he’s missed. The key for Parra though is that he’s felt healthy before, during, and after each of his stints on the mound both in games and doing side work. There is absolutely a spot open for a left-handed relief pitcher on this 25-man roster, and since Braddock does have options and Perez is in camp on a minor-league deal, it would seem like Parra has a leg up for depth-related reasons if all else is equal. We’ll learn more as the spring progresses, but you can’t just expect Brewers Manager Ron Roenicke to make his determination early enough that we’ll all be able to analyze it to death. He isn’t prone to announcing decisions such as that one any earlier than he is forced to. In the meantime, Parra has plenty to prove this spring. After all, Roenicke hasn’t seen Parra pitch a whole heck of a lot in person. That could make all the difference as familiarity can breed preference. Luckily, Roenicke seems to rely on performance much more than familiarity to this point in his career as manager. And at this point, Parra could use a bit of luck on his side. Pitchers and Catchers report today for the Milwaukee Brewers. It’s a symbolic moment for the team and for the coming end of winter, and although this winter has been remarkably mild in Wisconsin, the norm is a long and cold winter up in these parts. Therefore once P&C Day arrives, it makes you feel like there will be spring eventually again in the northern midwest. Dillard, once he was converted to a pitcher, used to have a standard over-the-top delivery. He experienced decent enough success that he earned a trip to the majors in 2008 but was knocked around a bit, and more so in his short pretty heavily. Eventually he was sent down and didn’t appear to have a path back to Milwaukee. He then modified his approach and became a sidearm pitcher. It was a way to make him stand out from the pack and help him find his niche. It worked, and Dillard rejoined the big league club in 2011. He’s never been a shutdown pitcher and honestly shouldn’t face a left-handed hitter…ever…but he is a useful piece as a long-relief man and situational right-hander. On a “first division” team, Dillard doesn’t have a true home. He is a tremendous individual (I had the pleasure of chatting with him for a few minutes at a charity event last season), but this organization has better pitchers available as options when everyone is healthy. Despite that, I decided to profile Dillard for a couple of reasons. First, he’s spent time with the Brewers so people know him, but more so than that is the fact that he’s out of options and, barring injury to one of his colleagues, he’s unlikely to break camp with the club. That’s significant because to get Dillard back to the minor leagues where he can stay ready to contribute should the injury bug plague the bullpen, he’d have to be exposed to waivers. Dillard has successfully passed through them before, but nothing is guaranteed. The best chance to Dillard to make the club out of the Spring Training would be if Doug Melvin and Ron Roenicke decide that keeping depth is more important that keeping a better arm. Having said that though, some would argue and Frankie De La Cruz has a better arm and he is also out of options. In my 25-man roster projection which I’ll be stating on the podcast I plan to record later today, I have only one open bullpen slot to be contested between Dillard, FDLC, Zach Braddock and Brandon Kintzler. Kintzler and Braddock both have options remaining so they could begin the year at Triple-A if the Brewers want to keep that extra depth. Regardless, Dillard stands to get enough work this spring in order to gauge where he’s at in comparison to the other options for the last spot in the ‘pen. If he doesn’t make the cut but does sneak back through to the minor leagues, Dillard is absolutely an option to be called up when his special type of services are required. Welcome back to this lengthy consecutive days streak for the “Brewers By the (Jersey) Numbers” series. 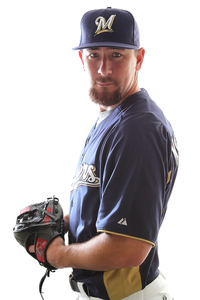 Yesterday, which was 59 days away from Opening Day, saw the first legitimate 2012 big leaguer profiled in John Axford. Michael Melton McClendon is a 6’5”, 225 lb, right-handed relief pitcher who made his MLB debut on August 14, 2010 after being selected by the Milwaukee Brewers in the 10th round of the 2006 amateur draft. McClendon has had a fair amount of success in the big leagues, given his inauspicious promotion and use in mostly low-leverage situations. 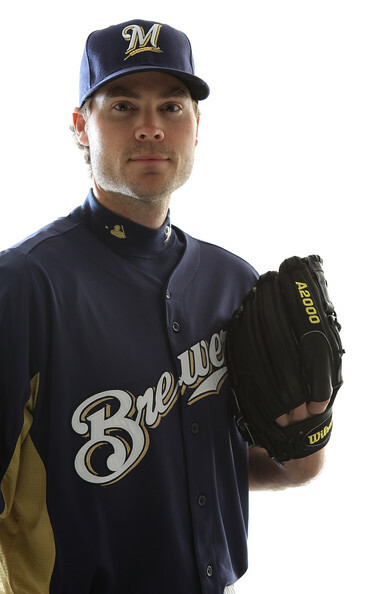 He stayed up with the Brewers from his debut in 2010 through the end of the season. His MLB campaign saw the Texas native appear in 17 games, totaling 21.0 innings pitched. His first two appearances were 3.0 inning jobs, which shows that he wasn’t exactly designated for “close and late” situations. The balance of his year resulted in a line of: 2-0, 3.00 ERA, 21.0 IP, 15 H, 7 ER, 2 HR, 7 BB, 21 K. He held opponents to a .195 batting average and saw his WHIP finish at 1.05. The next year, McClendon got a nice look in the spring but wasn’t brought north to Milwaukee. He began the season with the Triple-A Nashville Sounds where he would pitch in three games (1-0, 6.1 IP, 0 R, 4 H, 1 BB, 4 K, .174 BAA) before being recalled to Milwaukee on April 19th. McClendon would pitch that same night against the Philadelphia Phillies, allowing just one walk in an otherwise perfect ninth inning, sealing up a win for Milwaukee. That appearance kicked off a 2011 for McClendon that would see him pitch in eight more games for the Brewers before being sent back to Nashville due to the return of Zach Braddock from the disabled list. In those nine appearances, McClendon only gave up runs twice. One was a true blow up type where he allowed three earned runs on five hits (including one home run) in an inning and two-thirds at home against San Diego. I remember, because I was there! It was that game where the Padres scored eight runs in the eighth inning en route to a 13-6 victory. Otherwise, another very encouraging season from McClendon. He totaled a 2.63 ERA in 13.2 innings, won three games, finished with a 1.32 WHIP after surrendering 15 hits and three walks. He did strike out 10 over the nine games as well. The other lasting legacy of McClendon’s time in Milwaukee was the introduction of the quick pitch to many fans. LaTroy Hawkins used it a few times as well, but McClendon really brought it to the forefront of Brewers fans’ minds. Back in Nashville, McClendon finished the Triple-A season with 38 appearances, all in reliefe. He tossed 58.2 innings, and produced a 5-6 record, 3.53 ERA and recorded 8 Saves. Looking at the total picture, it was a solid season for McClendon. He has things to work on, but so does every player. The bottom line for the team is that he’s shown flashes of being a reliable and capable option for a call-up in the case of injury to one a member of the bullpen. Barring injury, Mike McClendon isn’t likely to make the 25-man roster out of Spring Training. He will start the regular season in Nashville’s bullpen. These are likelihoods that you can feel comfortable with. I just suggest that he keeps at least one carry-on bag packed. A late start to today’s installment of “Brewers By the (Jersey) Numbers”, but that’s certainly not due to a lack of consideration for today’s player. Rather it was caused by an extreme case of exhaustion on the part of yours truly after a long night Wednesday into Thursday. If you’d like some proof, go look at when the Michael Fiers article was posted and then added an hour or so onto that for my bed time. Enough about me. That’s not why you’re here. You’re here because being 63 days away from Opening Day on April 6, 2012 means you get to read about a pitching prospect that logged big league time in 2011 while wearing jersey number 63. That man is none other than Eulogio (pronounced ay-oo-low-HEE-yo) De La Cruz. Frankie De La Cruz has logged big league innings with four different teams in the four years he’s been on a big league roster. Originally with Detroit, he was traded to the Marlins organization as a part of the Miguel Cabrera deal. After exhausting his final minor league option, he was traded from Florida to San Diego in March of 2009. De La Cruz was then designated for assignment by the Padres just over a month later after the Padres had to call up a starting pitcher (Chad Gaudin) to cover some injuries. 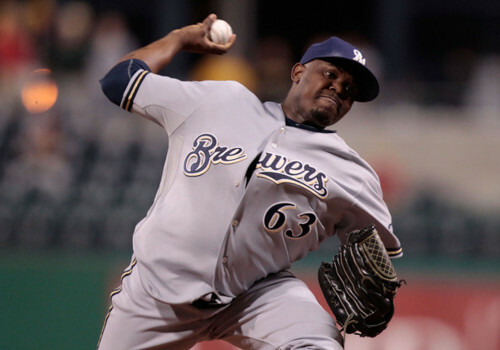 After spending the 2010 season pitching in Japan, De La Cruz signed a minor-league contract with the Brewers prior to the 2011 season. He wound up pitching in 11 games for Milwaukee, allowing four earned runs over 13.0 innings pitched. His major issue in previous big league stints, walking batters, didn’t flare up as much with Milwaukee. He “only” walked five while allowing 10 hits. It worked out to a 1.15 WHIP and clearly aided him in compiling a 2.77 ERA. What the future holds for De La Cruz as a member of the Brewers organization is something of a mystery, however. 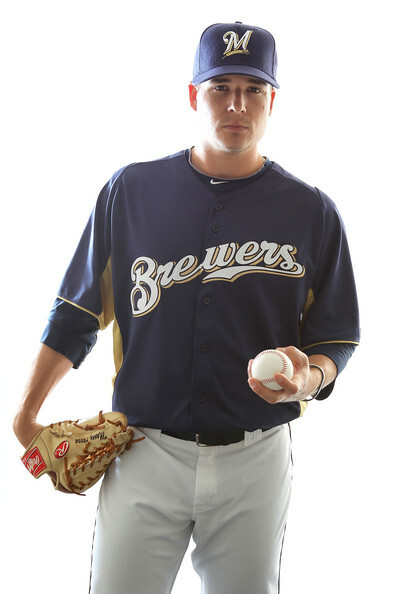 He is out of minor league options and the Brewers have a number of bullpen arms returning to the team after being out with injuries in 2011. Manny Parra, Zach Braddock, and Brandon Kintzler all stand to have a shot to head north as a part of the Brewers bullpen. Parra is out of options also, but Braddock and Kintzler both could be optioned down if Doug Melvin decides that depth is a focus. It may seem like the numbers game isn’t set up to work in the favor of De La Cruz, but he has an opportunity to pitch his way to Miller Park this spring. If I had to formulate a guess as to the bullpen right now, it’d be John Axford, Francisco Rodriguez, Kameron Loe, Parra, Marco Estrada and José Veras all making the team for sure. The departures of LaTroy Hawkins and Takashi Saito to parts out west opens up a couple of jobs, but De La Cruz is hardly guaranteed of a spot. He was left off of the post season roster last year, after all, and only has a total of 32.0 innings pitched over his career. Working in his favor are a fastball and curveball that once lead to a #6 ranking in the Detroit Tigers prospects list by Baseball America. These pitches haven’t developed as dominatingly as some no doubt hoped when he was labeled as a future big-league closer, but the raw stuff is still there somewhere. 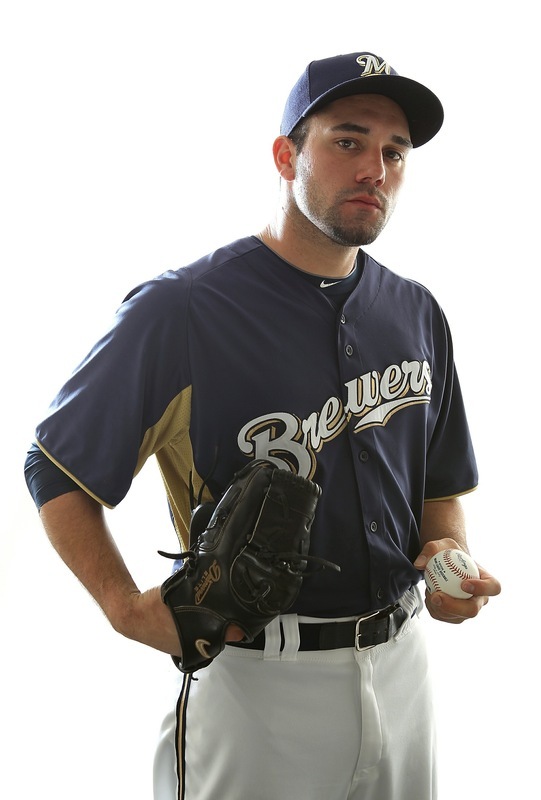 Bottom line for De La Cruz is that despite relatively effective appearances for the Brewers in 2011 after being called up to replace an injured Chris Narveson on the roster, nothing is close to guaranteed for FDLC going into 2012. He’ll have to pitch well from the jump in order to force his way back onto the 25-man roster. Is it doable? Certainly. Is it likely? That remains to be seen once the mitts start popping in Maryvale on February 20th.